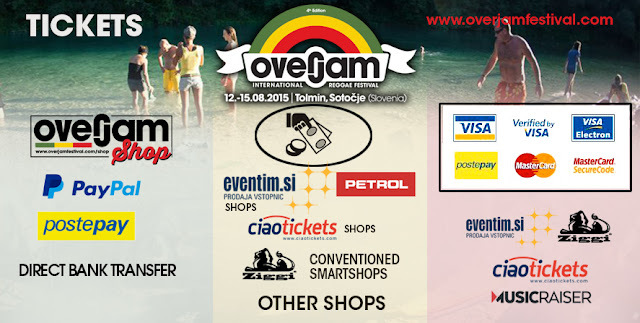 Overjam International Reggae Festival will be held in Slovenia, in Triglav's National Park and beside the most beautiful river in Europe, Soča. At very few kilometres of distance from Trieste, Ljubljana, Venice, Wien, reaching the 6th edition, now it has the right to get into the “top 10” of the European reggae festivals. 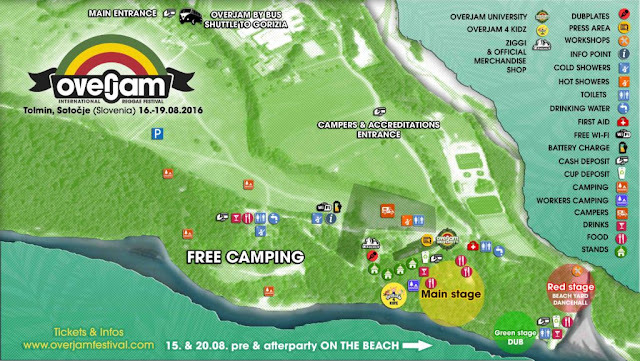 Overjam Festival will present you an amazingly relaxing atmosphere. The Festival will last from 16 - 19 August 2017, but it will also include a pre-party night on the evening of August 15th. Camping opens on Monday, 14. of August 2017 at 8:00 and closes on Sunday, 20. of August 2017 at 15:00. You can buy the ticket at the festival or you can also buy it for cheaper price at pre-sale. If you are a lover of reggae music and beautiful nature you really should not miss this festival that is located in the beautiful National Park in Slovenia. Overjam Festival will organise a pre-party night on the evening of August 15th. It will also be possible to buy tickets or exchange them for wristbands on the 15th of August. The camping will open on August the 15th at 1 pm. Already since the 15th, you will need a ticket in order to get the access to the camping area. Festival area will be open 24/7. The security will check anybody entering the Festival area. Due to international laws no alcohol will be allowed to enter the Festival area. Check-in and check-out into the festival area every 26 hours: check-in at 12h and check-out at 14h the next day. Entrance box will be open from 10 am until 1 am. From 1 in the night until 10 in the morning it won’t be possible to buy tickets. On preparty day entrance box will be open from 1 pm until 1 am. Children under 12 years old are free of charge. Children under 16 years old must be accompanied by parents, legal custody etc. Disabled people can bring their escorting person to the Festival area for free. Please note that an official medical certificate will be demanded upon your arrival! 105,00 EUR at the festival. Residents of Tolmin region are offered a discounted price of 30€ for the entire festival. They can purchase the ticket directly at the entrance box with valid ID. If the visitors stay at the festival for more than a day, the price for parking ticket remains 10€. Price for campers is 50€. Visitors must park their campers in the area fitted for campers. If visitors wish to temporarily leave the area with the camper, they will have to purchase a new parking ticket for campers (50€) at the return. Facilities – toilets and showers for the disabled will be available. Disabled people can bring their escorting person to the Festival area for free. Please note that an official medical certificate will be demanded upon your arrival! Overjam festival is located in Triglav’s National Park and due to its environmental law’s protection and conservation of pristine nature is it’s first task. Therefore no open fire is allowed in the area: open fire includes any kind of barbecue, fireworks, candles etc. Protect the nature! Camping is available to festival guests free of charge, but is a subject to possession of a valid festival ticket. The nearest town is “Tolmin” which offers big supermarkets (Mercator, Eurospin and Hofer), bars, restaurants, tourist info office, ATM and a 6 a.m.-21 p.m. gas station. The nearest bigger town is NOVA GORICA (39 km) in Slovenia and Gorizia (41 km) in Italy. Nevertheless, food and drinks at good prices will be available inside the Festival area around the clock! Early arrival is a subject to Early arrival fee 20 €, with a possession of a valid festival ticket! Do not miss the only Slovenian reggae festival, the Overjam International Reggae Festival in Tolmin, Slovenia!